In the market for some star-studded spiritual forecasts of the romantic variety? You're in luck. This montage video from Hollywood Medium's past seasons sees Tyler Henryserving up relationship advice like some sort of love doctor from the other side. "I guess I want to know if I'm gonna find love again and if I'm gonna have more babies," Amber Rose tells him at the start of the video. Their conversation originally aired in early 2016. At the time, it had been a little more than a year since Amber filed for divorce from her previous husband, Wiz Khalifa, with whom she shares one son. "What's interesting about this is that I'm either seeing a relationship with someone who has a record label… I'm seeing a record label, record label, record label," Tyler says. "I don't want you to date a rapper." "No, I don't want to date a rapper anymore. Get them away from me!" Amber agrees. Tyler reveals there might be another prospective love interest on the horizon for Amber—someone whose name bears a 'T' initial. "That's all I'll say," he tells her. During a 2018 conversation with Iggy Azalea mid-way through the clip, Tyler acknowledges that Amber didn't exactly abide by his spiritual guidelines. "I already know not to talk to any rappers. Don't worry," Iggy says. "I gave the same advice to Amber Rose," he replies. "She didn't take it." It looks like Khloe Kardashiandidn't either. Tyler's eerily accurate read on her and Tristan Thompson's long-distance relationship prior to all the drama that erupted last spring pops up in the compilation video too. "For you, I'm really feeling like love life is not the area right now that is reaching its peak," he tells the KUWTK star. "I'm seeing a clock. And it's symbolic for basically saying that a schedule, or two peoples' schedules, would not be ideal for a cohesive relationship." "I would say, for the current situation, so long as we can make sure distance does not end up being an issue, we're fine," Tyler finishes. 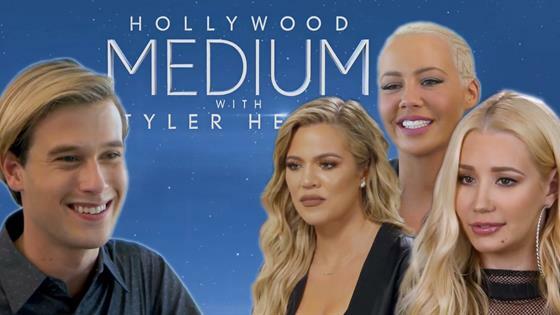 Check out the video above to relive the best of Tyler's love prophecies and see what Khloé had to say about his thoughts on her relationship!